Jordan came to be a part of my life back in September of last year (2003). My kids had met Jordan at one of the GALT meet and greets at REI. At Hockey Fest in July my son, Ryan (12), stayed with the GALT volunteers and hung out with Jordan. After the event I started giving serious consideration to adopting a Greyhound. I started researching the breed and GALT. 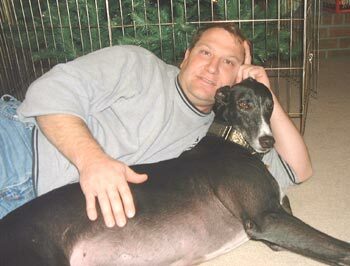 I found that GALT was sincere in placing the dogs with loving, responsible, forever homes. In late August I took the plunge and submitted my application to adopt Jordan. My daughter, Jessica (9), was thrilled when I told her that I had submitted the application, she wanted to know when we could take Jordan home. The following week we picked up Jordan and brought him to his forever home. GALT helped me with the transition and has become part of my life. The kids and I have participated in GALT events around the Dallas area hoping to spread the word about how greyt the breed is and what wonderful pets they make after retirement. Jordan has been camping with the family, met the mayor of the City of Denton, and walked the "Buddy Walk". He also celebrated the greyhound breed on Greyhound Planet Day, and got to trick or treat with Jessica. Thank you GALT and many of the others involved in bringing Jordan to my family.